I finally spent some money on my system again. I got the Apogee, the Water block for the GPU, and some ramsinks for my vid card. 10 feel of .5 inch ID tubing, some clamps and some elbows. 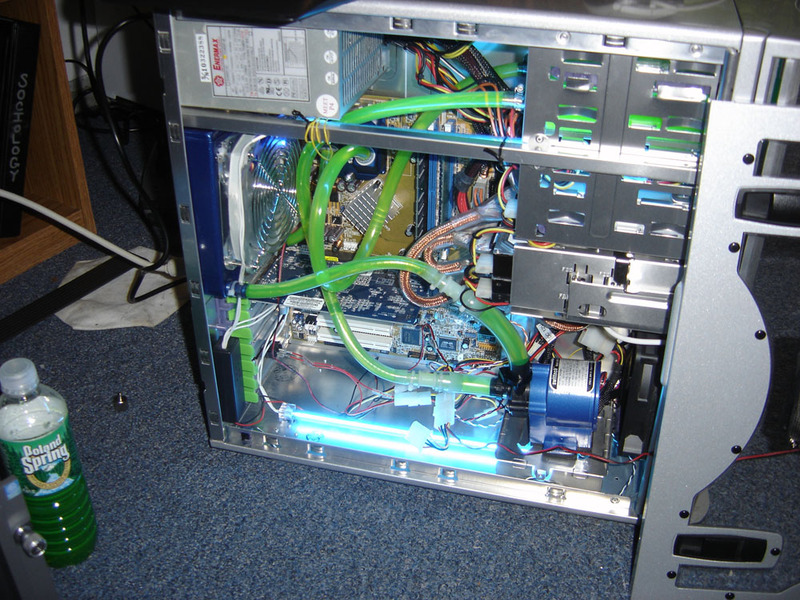 I am moving everything out of my PCV-2000B and putting it all back into my PC75 very soon. All I have left to get is a Northbridge water block and I think I will start assembling. I have to figure out a drainage system though. I have a couple of valves from the origional swiftech closed system, but they are 3/8 ID. Maybe I will get some connectors that transform the sizes. It really won't inhibit the flow because they are strictly going to be for drainage. Damn, hit the lottery or what? No, tax refund! I miss my water rig. 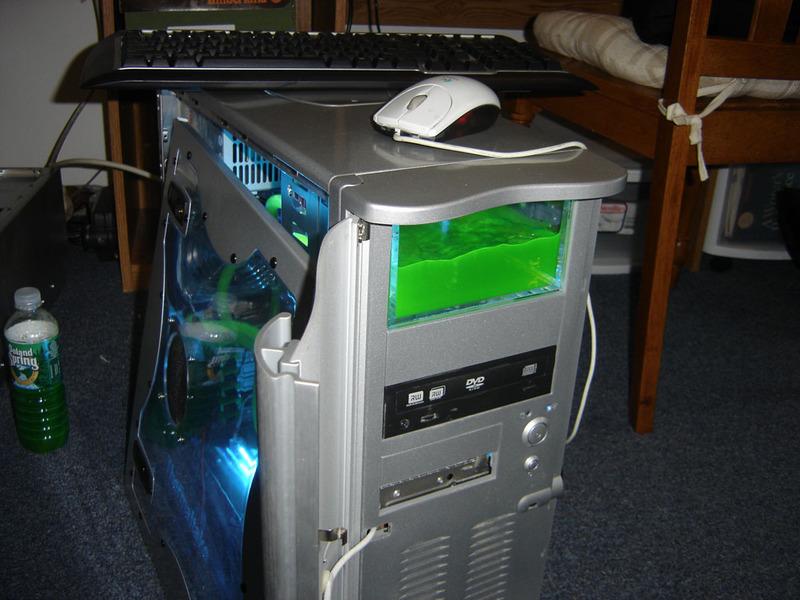 I had the rig completely setup, but didn't find a tiny leak in my res. 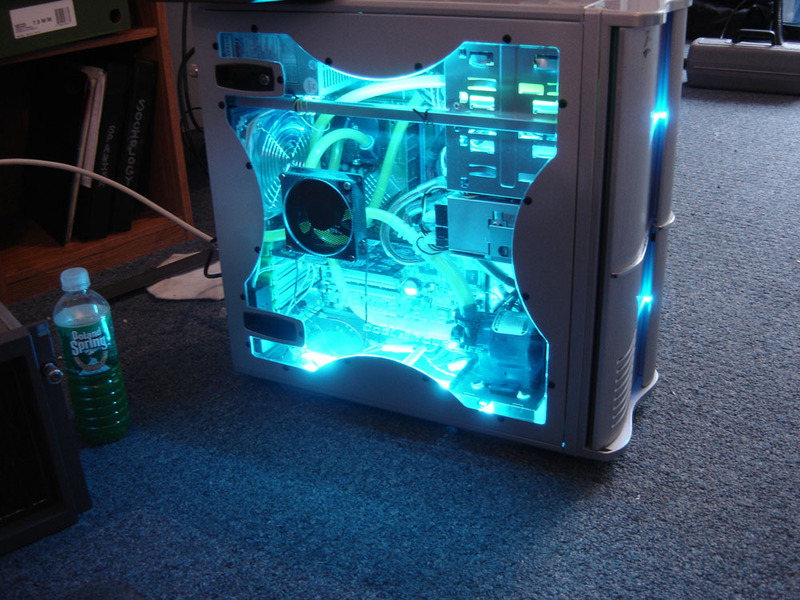 Since that time I have rebuilt the water setup about 3 times and have poored water on my components a bunch of times. This time, I am going to have to wait a couple of days before I power up because i had a decent size spill draining the system out. I am going to try the Fluid XP coolant and see how it works. If it doesn't do well, I will have poored water on my components 2 of those times for nothing. I am anxious to see if it will live up to its claims about being able to be poored on a working system and have no effect on it. I will test this out on an older pII setup! I have a small leak somewhere and I can't find it. My fluid levels are steadily dropping at a slow rate, but I can't find a leak anywhere. I am going to top it off and let it run for a few more days to see if it may just be some air that was released. I am skepticle that this is the case though because small air bubbles will not cause your res to lose almost .25 inches in fluids! Wap it in colored paper and watch it. Here are some pics of the gittup... there will be more. I still have not found my leak... I don't know what is going on. I am hoping that it is just air being released from the rad or something. I'm telling you. Dry the outside of the radiator off completely, wrap it in colored paper and see if it leaks. I have always noticed a large congregation of air around it... i shook it around a bit and a TON of air was released! I miss my res... I wanted to go back to the simple front though. I still have to mask my drives so they are invisible. Then all you will see is my two Rhostats and my floppy drive. YES I HAVE A FLOPPY DRIVE! It is hard to believe, but my floppy drive comes in SO HANDY! there are times when I can't live without it. i will go for months on end without using it... then, one day. I NEED IT! 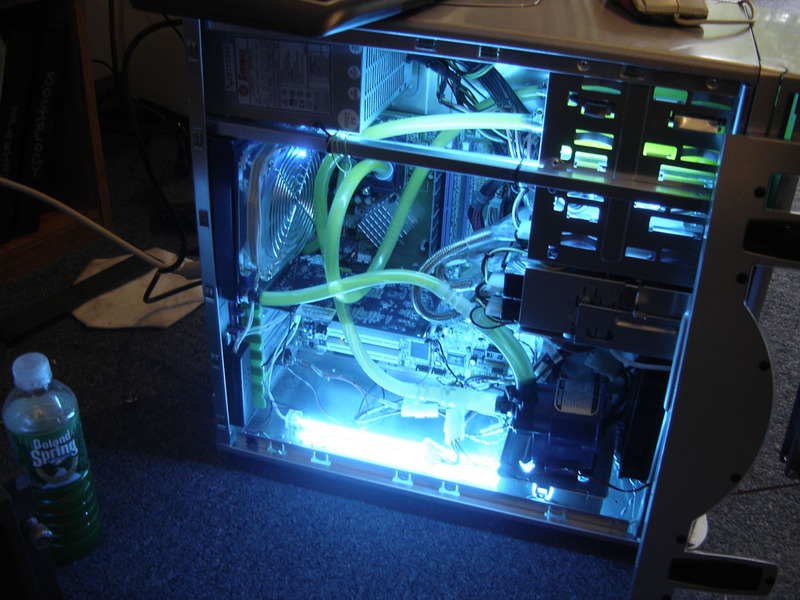 I think at most times, NB watercooling is a waste of money. This is the first rig I have water cooled the NB and I don't notice much difference in temps. maybe 3C. The only reason I actually went ahead and did it this time around is because the fan on the sink that came with the mobo was failing. sweet rig! That is the next giveaway item right?